Duplicators are the best in it's class. A complete standalone unit that can clone a 3.5" and 2.5" hdd/ssd to multiple hard disks alternately in a single touch of a button. 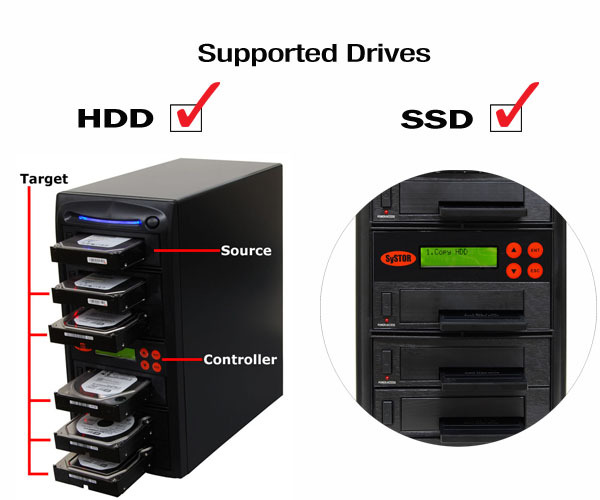 It copies the data sector by sector from the source drive to the target drives simultaneously, regardless of brand, operating system or format of the drives. The copy includes partition and boot sector information for a perfect clone. Systor HDD/SSD Duplicators are also DoD compliant when it comes to sanitizing / erasing data in the hard drive, this feature has been added to ensure that there are no trace of content left behind and for the consumers security and peace of mind. Can copy 3.5" and 2.5" hdd/ss hard drives.